The walls at the First Floor have been framed out. 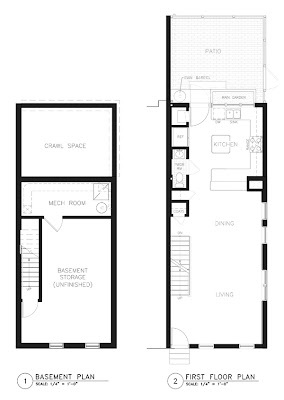 We tried to pack a lot of amenities into a small space (less than 3 feet wide by about 17 feet long) in order to maintain the 'openness' of the First Floor. These are the only walls at this level. 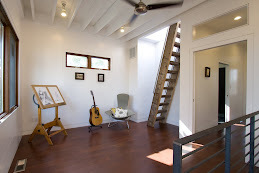 They are 'in line' with the stair so they do not interrupt the long rectangular space of the living/dining/kitchen area. 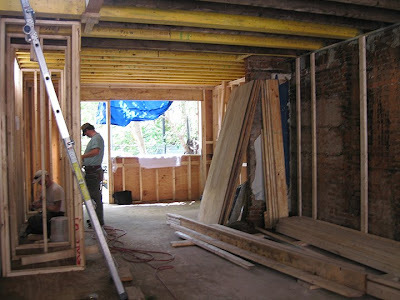 Here's a view from the front door (looking through where the stair will be) towards the newly framed walls on the left. Beyond are the windows and door in the kitchen. 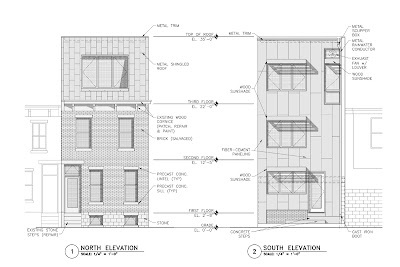 Also, in between the wood studs (the ones spaced about 3 feet apart) on the brick wall at the right of the picture, there will be two 3' Wide x 6' High windows side by side - triple high units with the center unit being an operable awning. This will being an incredible amount of natural light into the center of the house. 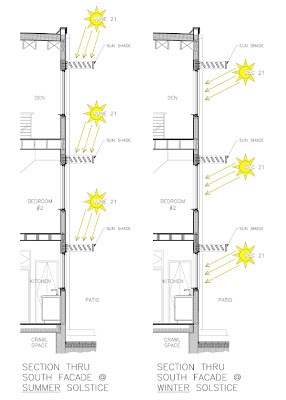 Although the wall faces west, the 3-story houses next door (about 15 feet away) will provide shade in the late afternoon and prevent these windows from getting too much of the harsh exposure from the western sunlight. So this was very exciting to see. 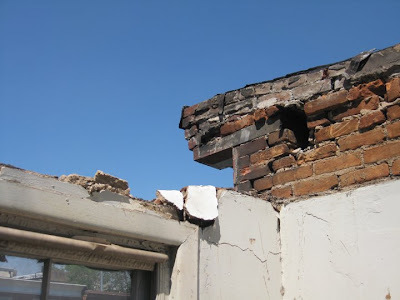 In less than two days, they removed the entire roof and began to cut the top of the brick down in order to create a level surface to place new concrete block. The mason will lay CMU up a few courses and match the height of the tall wood stud wall that you can see in the back of the bottom image. 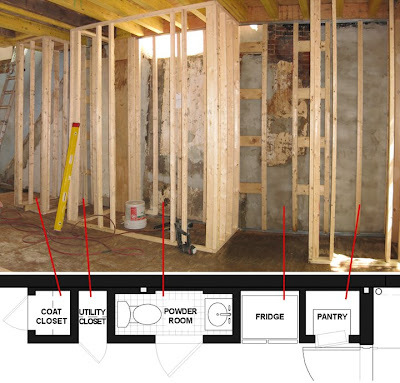 After this, the framer can install the joists for the third floor and immediately begin framing the third floor walls and the new roof. What a mess! They had to drop sections of the roof down through the stairwell and carry it out the front door. Talk about hard work. 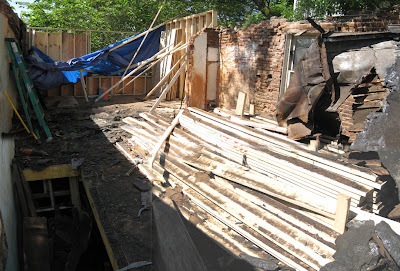 Since most of the existing roof was garbage (and very heavy) and could not be recycled, we had Construction Waste Management bring a dumpster in order to haul all of this away. Although, they will still bring the dumpster to their yard and separate the material in order to try and recycle what they can. 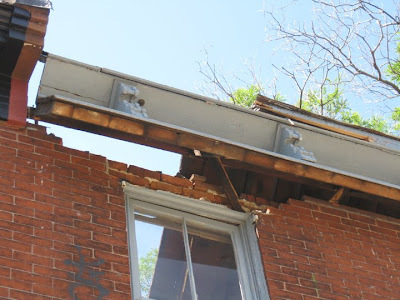 We are saving the existing cornice. Above, you can see the entire piece being removed. The cornice will be cleaned up and repainted black (to match the color of the windows) and then reinstalled at the top of the new 2-story brick facade. It will be about 2 feet higher than it is now due to the fact that we raised all the floor-to-floor heights. At the end of the day, the crew had cleaned up the site nicely. You can't see it yet, but beyond the trees and facade across the street, is a spectacular view of the Philly skyline. This will be visible from the Master Bedroom and even more so from the roof. 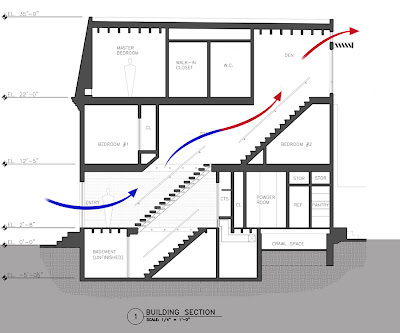 The open stair acts as a 'chimney', and with the help of a whole-house fan at the third floor, warm air is able to exhaust out of the roof of the house while cool air is drawn in though the operable windows on the other floors. This will reduce the need for mechanical cooling on most summer days. 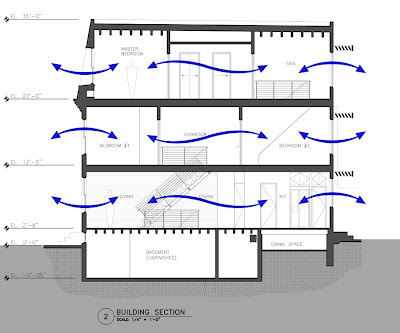 Numerous operable windows as well as the open floor plan design allow for cross-ventilation at all floors. This will continually allow fresh air into the home and reduce the need for mechanical heating or cooling during the temperate months. Louvered horizontal sun shades are located above all the windows on the south facade. The shades will protect the south-facing glass from direct sunlight during the summer months but allow adequate heat gain from the suns rays during the winter months. This will dramatically reduce energy cost related to heating and cooling. All of the Second Floor joists have been raised up about 8". This ends up giving us about a 9' ceiling at the First Floor. 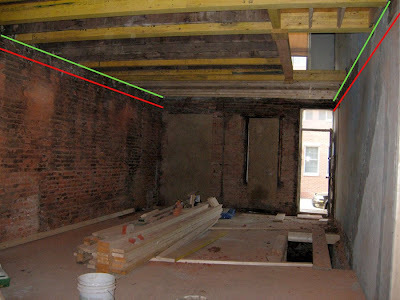 The red line in the image below represents where the joists originally were and the green line is where they are now. It might not seem like much but it made a huge difference in how big the space feels. 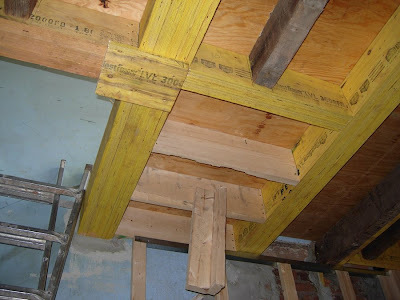 Here you can see some of the new floor joists in place. 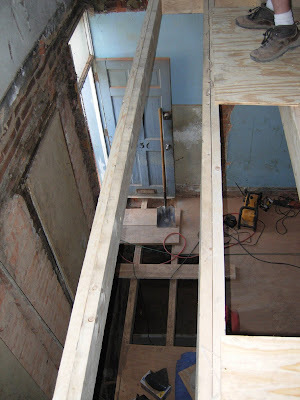 We needed to double and triple-up some of the new joists and use LVL's, in order to keep them the same depth as the original timber joists. An interesting shot from the Second Floor looking down at the Entry Door on the First Floor and then on down into the basement. If you look closely you can see the edge of the original claw foot tub that is slated to get refinished and used in the Second Floor bath. We are storing it in the basement for now. Here is a shot from the newly framed Second Floor. I am standing in what will eventually be the front bedroom. You can see how low the original roof is! The new level of the Third Floor is about 3' above this! 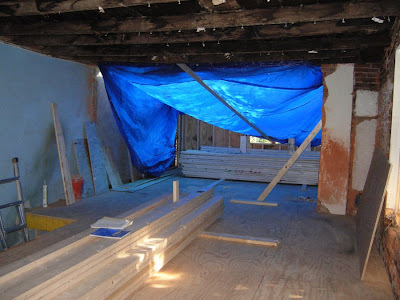 The blue tarp is covering the rear addition until Third Floor is built. 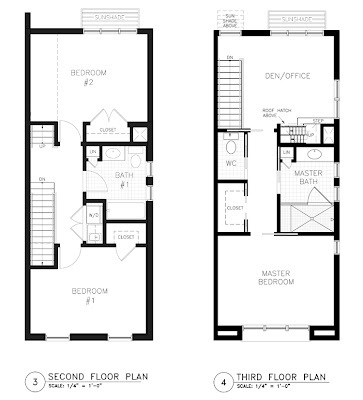 Here are the Floor Plans and Exterior Elevations. There is a basement with three stories above. 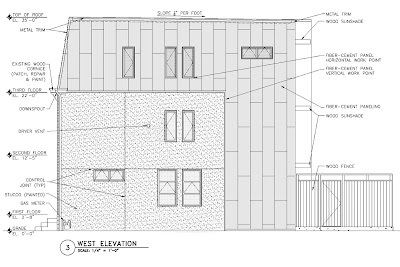 The West Elevation clearly shows the distinction between the old (extents of the existing house) and the new (rear addition and Third Floor). concrete) the party wall on the left. 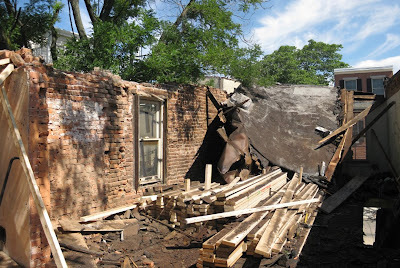 After it was uncovered during demo, we found this existing brick wall to be in really bad shape, so we had to take extra measures to ensure that all the bricks remain in place. The top plate you see running horizontally above door and windows represents the ceiling height. The next task (which is probably complete by now) is to realign all the floor joists on the Second Floor. This was necessary due to the fact that most of the floor was out of level due to settling and sagging over the years. 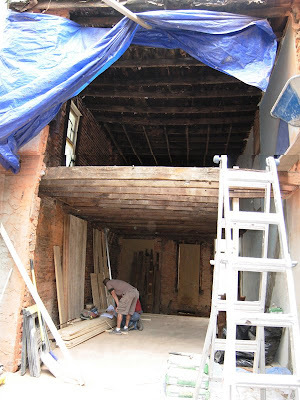 Also, many of the joists needed to be replaced. So, we figured that since we need to move all the joists anyway, we might as well bump them all up about 6". This gave us more ceiling height on the First Floor but still kept a nice height at the Second Floor without changing the height of the Third Floor. As you can imagine, there was some redesign needed for the stair but it all worked out beautifully in the end. After this is done...the roof comes off! 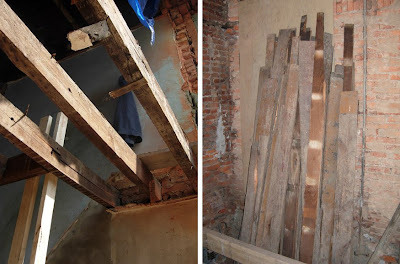 Here you can see one of the compromised joists we found (on the left) that needed to be replaced. You can see where it is split due to the fact that header beam from the old stair was notched into the middle of it. A nice detail but obviously too much weight over the years for this joist. 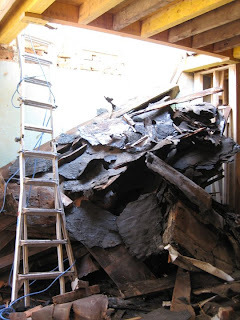 The image to the left shows all the old Heart Pine floor boards from the Second Floor. These will be cleaned up and stored in the basement for future use.